In February of 2007, I had the suprising opportunity of appearing on the Rachael Ray show, as the winner of her first annual "Burger Bash" contest. The contest stipulated a maximum of ten ingredients-but if you don't mind using eleven, I recommend adding an egg to the turkey mixture. If not, go a little easier on the green salsa. They're firmer and easier to work with that way. 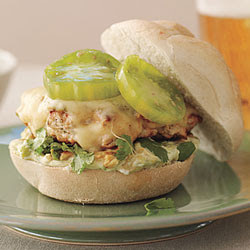 You're going to love these burgers, especially if you have some green tomatoes in the garden! They are juicy, cheesy, slightly spicy and absolutely scandalously good! the split side of each roll bottom and cover with 1/4 cup cilantro. Top with a patty and 2 tomato slices; set the roll tops into place. Droooool! It definitely looks like a winner, congrats Prudy! funny- i ran across these on tastespotting- and having seen and made these from the recipe in rachael ray's magazine about a year ago- i immediantley thought- that's THAT recipe! For some reason I went on the defensive and started to think someone had stolen it and was trying to pass it off as their own, but much to my pleasant suprise- the original recipe- in all it's glory-right here, just a few mouse clicks away. Great burgers by the way.